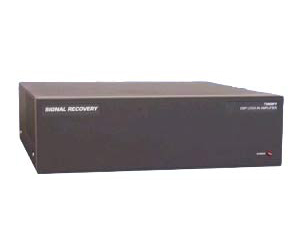 The model 7280BFP has exactly the same specifications as the standard model 7280, but can only be operated from a remote computer. As such, it is ideal for use both by end users and manufacturers in complex systems where front-panel operation is not required. All signal connections are made via the rear-panel BNC connectors giving an uncluttered appearance, especially when the unit is mounted in an equipment rack. Control of the unit is via either the RS232 or GPIB interfaces, using simple mnemonic-type ASCII commands. A second RS232 port allows up to sixteen 7280BFP or compatible instruments to be operated from a single RS232 computer port by connecting them in a "daisy-chain" configuration. Compatible software is available in the form of a LabVIEW driver supporting all instrument functions, the Acquire™ lock-in amplifier applications software and the SRInstComms ActiveX control and SDK.